As you know for the past three years, we’ve been involved with life-to-life discipleship, an emphasis of our North American Lutheran Church (NALC). Like other NALC congregations, we’ve received coaching from the Navigators. Currently, we have nearly forty Living Water people involved in life-to-life discipleship groups convened by members of our congregation’s Life and Learning Team. The word that’s been translated into English as disciple is, in the Greek of the New Testament, mathetes. It means learner, pupil, student. To be a disciple of Jesus is to be involved in learning how to cooperate with the Holy Spirit sent to us by Jesus when we are baptized to be more like Jesus, the One Who has saved us from sin and death and darkness. Discipleship is a process, a way of life by which God makes our lives more and more like the life of Jesus Himself (Galatians 4:19). If being a student sounds boring to you, you need to remember what Jesus means when He calls you to be His student, His disciple. When Jesus called people to follow Him, He didn’t take them to a classroom. He called them to follow Him, live alongside Him, observe Him, and then, after He’d deputized and empowered them with the Holy Spirit, to do exactly all He did: share the good news, heal the sick, cast out demons, and make disciples. Jesus’ classroom for discipleship is the world we live in. The textbook is His Word, the Bible. The classmates are first, fellow believers who we help and who help us to live out our faith in Christ through small groups in which people reflect on Scripture together, pray together, and own their common need of God for everything, including forgiveness. It’s probable that most of you here tonight can’t remember a moment when you didn’t know about Jesus and believe in Him. But it’s also possible for Christians to continue as baby disciples all their lives, And that’s tragic. Jesus doesn’t love us any less when we refuse to grow up as Christians, any more than parents love their problem children who refuse to grow up any less. But if we’re not seeking to be faithful disciples of Jesus, we will miss the joy of intimacy with God, be ill-equipped to face life, be unable to make good decisions, make the most of our time on earth, or be all that God intends for us to be. Jesus expressed a similar frustration with the apostles when, after following Him for several years, they still seemed unable to live out their faith in Him: “You unbelieving and perverse generation, how long shall I stay with you? How long shall I put up with you?” (Matthew 17:17). It’s a measure of Jesus’ grace and love that He continued putting up with the apostles and that He puts up with us even when we turn our backs on the call to discipleship, the call to grow in our faith, that could, if we paid heed to it, give us joy! Here’s the deal: If we’ve been Christians more than a few months, we shouldn’t be content to be mere spectators of the Christian faith; we should be full-fledged participants in the life of discipleship. 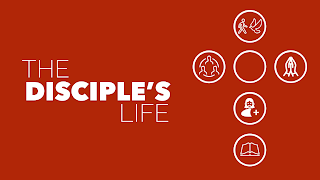 We should be disciples and be seeking to make disciples and we should be supporting each other in the disciple’s life. The first trait of a disciple is to believe in the God you and I meet in the crucified and risen Jesus. When we believe in the God we know in Jesus, we are set right with God, now and for all eternity. The two passages of Scripture we read earlier convey the same message: Discipleship is built on the foundation of believing in Jesus. Believe in Jesus and you are saved from sin, death, and darkness. But belief is more than what goes on between your ears, more even than the words of confession we speak at worship. Abraham’s belief in God, his faith in God expressed itself in what he did next: He packed up his wife and servants and livestock and belongings and headed for God only knew where. Believers are disciples and disciples are followers. Disciples let God decide directions and destinations. They follow the God we meet in Christ. When Jesus calls us to believe in Him, He says: “Whoever wants to be my disciple must deny themselves and take up their cross and follow me” (Matthew 16:24). The disciple’s life is built on believing expressed in a life of following Jesus.